Includes 18 feet of tracks and TWO cars! Kids love Magic Tracks! The totally new cool race tracks that bend and glow like you&apos;ve never seen before. You can bend, flex, and curve the track magically in 360 degree however you want - even while the race car is zooming around. With Magic Tracks Mega Set you get 18" of speedway! 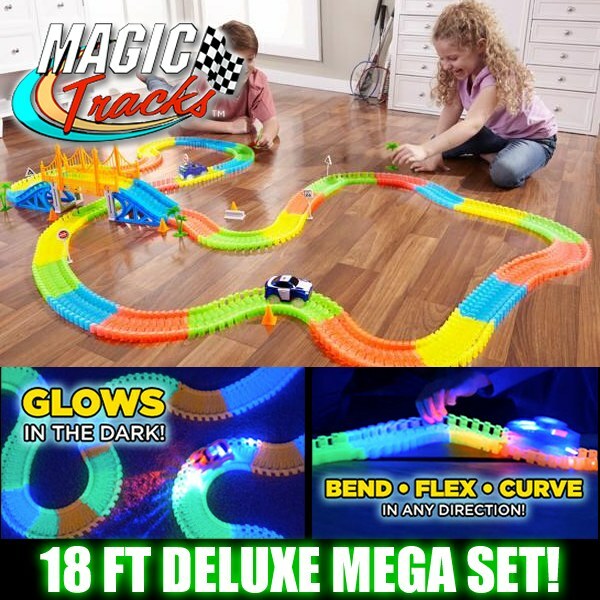 360 pieces of interchangeable, flexible, bendable glowing track - 18 feet! Assorted play accessories! Bridge, signs, trees and 2 LED cars. Was a big hit with my Grandson.